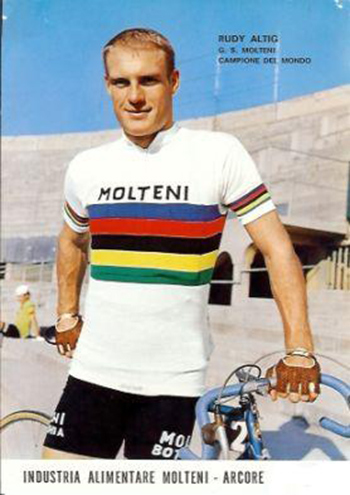 Rudi Altig was the winner of the 1966 world road championships, the 1962 Vuelta a España as well as a host of other races. He died on June 11 at the age of 79 from cancer. We have a Rudi Altig photo gallery telling about his remarkable career. Chris Froome wrapped up overall victory at the 2016 Criterium du Dauphine with a strong performance on the final stage. The Team Sky rider is only the fifth man to become a three-time winner of the prestigious stage race, clinching the yellow and blue jersey by 12 seconds after an exciting finish. Froome crossed the line 10th after a nervy finale into Superdevoluy, but was able to rely on the support of his teammates, as has been the case throughout the event. The race split apart significantly on the penultimate climb of the Col du Noyer, with Froome equal to the attacks of Alberto Contador, briefly settling into an elite four-man group. Wout Poels (fourth on the day), Sergio Henao and Mikel Landa were able to bridge back to their team leader ahead of the final ramp, and in doing so they ensured Team Sky also comfortably wrapped up the race's team classification. After the race a thrilled Froome confirmed: "It's amazing to be able to come back to the Dauphine and win it for a third time. The team were fantastic this week and the guys rode out of their skin keeping the jersey on my shoulders. "It's a massive satisfaction. Coming into this week I hoped I'd be fighting for the podium, and to be sitting here on the last day in yellow is really an amazing feeling. "The last few days have just been flat out and today was no different. The final there was pretty grippy and we were down to just a couple of us at the front at one stage. But again my teammates did a fantastic job, got back to the front of the race and helped control it for me right up until the end. "It is great timing to have a win under the belt. It does help build the morale a bit and build the team around me. There's still a lot of work to do before July but all the right signs are there now. The guys heading for the Tour de France look as if they're in great shape and things everything is heading in the right direction." The win marked a fifth Dauphine success in six years for Team Sky. After Sir Bradley Wiggins began the run in 2011 and 2012, Froome has now weighed in with three titles of his own, from 2013, 2015 and now 2016. The 151km finale saw Etixx - Quickstep help Sky with the pace-setting duties, but the race burst into life as Contador (Tinkoff) attacked from range yet again. Froome's lieutenants ably closed the gap, but further accelerations saw an elite quartet of Froome, Contador, Richie Porte (BMC Racing) and Romain Bardet (Ag2r-La Mondiale) crest the Noyer together. Way out front Steve Cummings (Dimension Data) attacked out of the day's 20-man break to claim the win by 3:58. The final metres saw the overall podium decided, with Bardet and Dan Martin (Etixx - Quickstep) securing their places on the rostrum, 12 and 19 seconds respectively behind Froome. Landa and Henao demonstrated Team Sky's strength in depth by taking 12th and 13th overall, while Poels, Luke Rowe, Ian Stannard, Salvatore Puccio and Michal Kwiatkowski all contributed to an incredible team result. It was racing until the very end on the final day of the Critérium du Dauphiné – this was to be no procession to the finish, but a day where every one of the 151km was going to be contested. In similar form to yesterday’s Queen Stage, Alberto Contador went on the attack on the day’s toughest climb an incredible three times before finishing just outside the top ten in the final push for the finish. After a strong performance throughout the week, Alberto finished the race 5th overall. With thirty-five seconds separating the top five places in the GC, there was everything still to race for on the final day of the Critérium du Dauphiné. While the 151km stage’s profile was marginally less difficult than the previous day’s Queen Stage, it was still going to be a hard day in the mountains for everyone. From the moment the flag dropped, the riders were climbing, with two categorised climbs out of the way before 35km were out of the way. While the day’s climbs would be tough, it was likely to all come down to the final 20km, where the race would climb the first category Col du Noyer before the final, short, category three climb to the finish in Superdévoluy. The 14% ramps towards the top were the perfect lanchpad for a punchy late attack. Like yesterday’s stage, a large group managed to get away and build up an advantage on the peloton. For the second day, Robert Kiserlovski went away, his breakaway group quickly building up an advantage, with the yellow jersey’s team unable to pull such a strong group back. Just past the halfway point, a lone rider attacked from the front of the break, quickly distancing them and building up a lead of thirty seconds. While it was clear the effort was hard, it looked as though his lead was sticking, with the peloton and the yellow jersey group were more than two minutes further back down the road. The aggressive attack had shattered the breakaway as they struggled to chase him down. As the final 20km came and went, the solo breakaway had a lead of more than four minutes, and there was every chance he would be able to stay out in front to the stage’s finish. All eyes were on the yellow jersey’s group however, as they hit the Col du Noyer for the day’s penultimate final climb. Looking comfortable and totally relaxed in the bunch, Contador attacked 12.4km out and immediately put other riders in difficulty. It was clear the Team Sky riders who were trying to chase him down were suffering horribly, yet the Spanish Tinkoff leader looked as though he was barely breaking a sweat. Going again when it looked as though he would be pulled back in, on the most difficult part of the climb, Alberto distanced the yellow jersey group once again. Three attacks in under 4km had left the yellow jersey isolated as his teammates dropped off – his strong effort cracking the yellow jersey’s support. 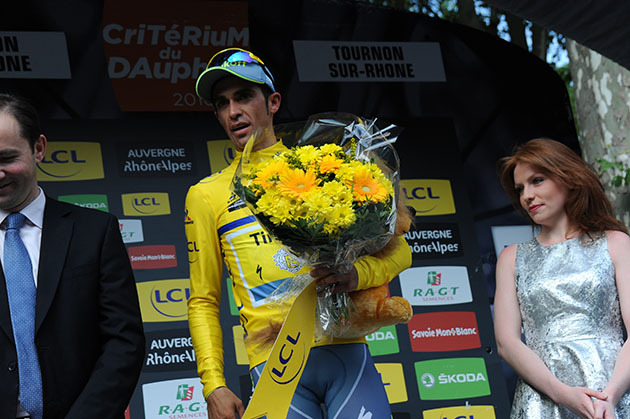 Alberto was well aware how much effort he was causing the yellow jersey’s domestiques to put in. "I tried my best until the very end. In the last climb, which was long and quite windy. In the previous climb, which was shorter but steeper, I tried to attack as well but I still don't have the rhythm. I saw that Sky started pulling but we decided to keep our pace and we saw them one by one being dropped until Froome was left alone. After a short downhill, the final climb of the day began. With the yellow jersey group back together, the small group was nervously eyeing Alberto to see what he would do next. With the stage won by the solo breakaway, the attention was on the bunch. As the approach to the finish came and the sprint for positions started, Alberto was blocked from joining the attack and was unable to take a higher place on the stage, but instead crossed the line next to the yellow jersey, just outside of the top ten. Coming into the race top of the UCI WorldTour rankings after top performances in the season’s early races and finishing fifth in the GC today and after some strong performances throughout the week, the race was all about Alberto and the team putting in some last checks of their form and abilities in advance of the Tour de France, and it was clear that Alberto had done what he set out to do, taking a stage win, wearing the yellow jersey for four days and launching some incredibly aggressive attacks multiple times on the very hardest climbs of the race, putting the hurt into his rivals. Alberto’s strong performance in the race was buoyed by his top ranking in the UCI WorldTour – something that wouldn’t have been possible without the support of their sponsors. “Last but certainly not least, I now lead the UCI WorldTour ranking. It was never a goal but, obviously, every rider is happy to reach that position. It also is a bonus to the sponsor, Tinkoff Bank, and Oleg Tinkov that have shown their strong support. We lead the team ranking and sit on the two top spots of the individual ranking." At the Tour de Suisse Jürgen Roelandts has taken over the leader’s jersey from Fabian Cancellara. Yesterday, the Lotto Soudal rider lost the opening time trial against Spartacus with less than one second. Today, Cancellara gained an extra second advantage on Roelandts at the intermediate sprint a few kilometres before the finish. In the final sprint, won by world champion Peter Sagan, Roelandts got fifth. There was a time gap of three seconds as of the seventh place and that made that Jürgen takes the lead with one second advantage on Cancellara! The Critérium du Dauphiné ended today with a mountain stage to Superdévoluy, won by Stephen Cummings. Chris Froome is the overall winner. Bart De Clercq could hang on in the group of GC riders and was thirteenth today, he’s eighteenth on GC. On Monday Jens Debusschere was close to victory, but it was Nacer Bouhanni who won. On Thursday Jens got fourth. After a brilliant attack of Tony on Tuesday also he became second. It was only Jesús Herrada who passed him by. Today the one hundredth Rund um Köln was scheduled. The race got decided with a bunch sprint. Dylan Groenewegen was the fastest, ahead of André Greipel and Nikias Arndt. While the weather forecast didn’t deliver on its promises – with a second day of rain despite a forecast of sunny conditions – Peter Sagan did what he can be relied on to do at every race. The UCI World Champion injected pace, power and excitement into the second day of the Tour de Suisse, taking the win in a textbook sprint effort in Baar. With his twelfth stage win at the Tour, Peter dominates the race’s record books with the most stage wins at the event. 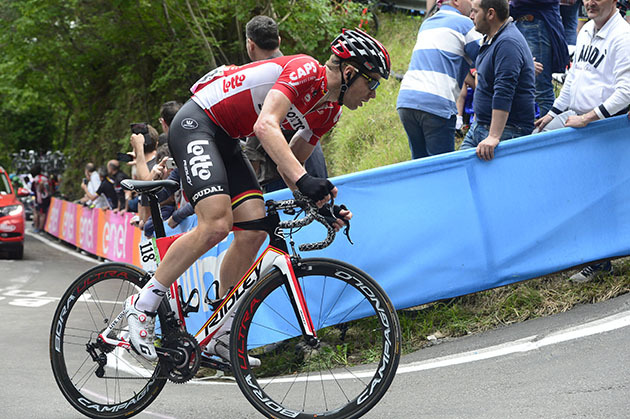 On the Tour de Suisse’s second day, the race remained in Baar for a testing 46.9km circuit ridden four times. The 187.6km route essentially repeated a single cluster of climbs to create a tough, undulating course. While the final run to the finish was flat, would the sprinters have the legs to contest it after such a gruelling day? This was likely to be more of a day for the all-rounders then – the riders who could get over the climbs and still push hard at the finish to take the win. After racing the opening time trial in wet conditions, the weather forecast at the start of the stage was predicted to be better. This wasn’t the case however, where it was raining on the riders at the start. While the rain was to hold off for the second half of the race, riders were confronted with ret roads and standing water as the race went on. This didn’t do anything to dampen the spirits of the peloton however, and it was racing from the drop of the flag. 15km into the day, a group of four went on the attack, and in 12km their advantage had stretched to an intimidating five minutes. While the gap wasn’t to extend more than this, it was enough to ensure the escapees had a comfortable advantage as they covered the day’s climbs. 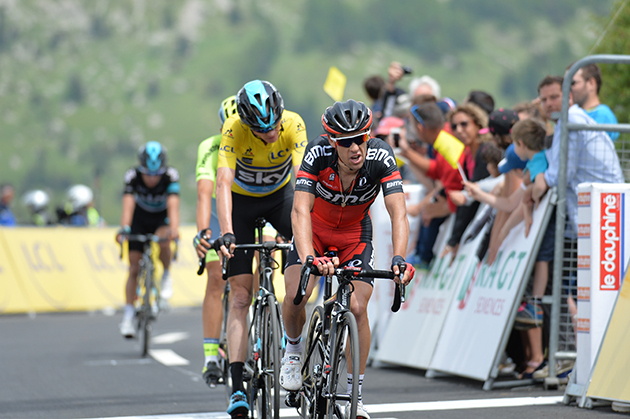 As the day went on, the breakaway’s lead dropped steadily. While their initial advantage had served them well, it couldn’t stop the relentless surge of the peloton. With the race leader’s team pushing the pace, Tinkoff, led by Peter Sagan, were able to expend less effort pulling the break in, and with it all back together with 35km to go, it was likely to come down to the expected bunch sprint. While there were a number of last minute attacks, the peloton wasn’t going to allow another break go so close to the finish, and with 10km to go, the Tinkoff riders made their first big effort at the front of the race, controlling the pace and working to ensure Peter was kept safe in the frenetic lead in to the finish. With the roads drying out after the day’s earlier torrential showers, teams were confidently upping the pace, with Peter working with his teammates as well as surfing the wheels of the other sprint trains. As the finish line approached, Peter chose his moment perfectly, tucked in a few riders back, he swung off the wheel of the man in front and charged towards the line. There was never any doubt as to who was going to take the stage as the UCI World Champion outclassed the other sprinters, crossing the line with his arms outstretched to celebrate the win. Stage 3 is another tough day, but another that could end in a sprint. The 192,6km sees riders take in six categorised climbs – the first of which is a hard second category ascent of the Hauenstein, cresting at 105km, which marks the start of the toughest part of the day’s riding. While the first half of the stage is undulating, the second half sees four categorised climbs clustered together on a final circuit before the finish in Rheinfelden. A sprint finish may await riders – if they can clear the day’s climbs still able to contest the finish. 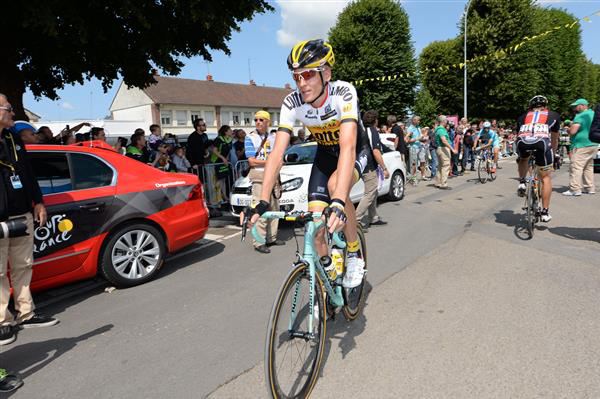 During the second stage of the Tour of Switzerland today, Robert Gesink crashed and had to abandon. 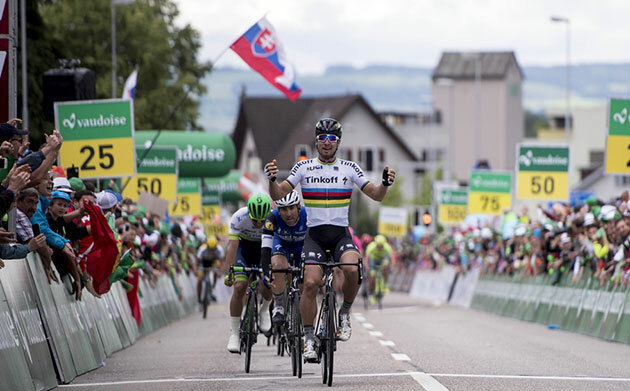 World champion Peter Sagan won the stage. LottoNL-Jumbo rider Tom van Asbroeck finished 10th. Gesink fell halfway through the stage and it was soon clear that he would not get back on his bike. "We saw that it was not a crash where you put a rider on the bike and let him ride again," said Sports Director Jan Boven. "We put him in the team car and took him to the bus where he was treated by the doctor, then I went back in the race." Gesink has several abrasions and at this moment he is in a hospital for further examinations. "I can’t remember anything of the crash," Gesink said. "I fell on my head and broke my helmet. I can remember that I started this morning, but after that, I lost it all." Bert-Jan Lindeman saw the crash because he was close when it happened. "There was a hole in the road and he hit it, his hands flew off the handle bar and he fell on his face. It's too bad because we sat all day in front as a group, and this is really sour. Plus we worked hard beforehand at an altitude camp the past few weeks so this is very disappointing." In the hectic sprint, the team worked for Van Asbroeck. "We know that Paul Martens and Van Asbroeck are fast, and we gave instruction in the morning in the bus to go for Van Asbroeck," Boven added. "It is too bad there was a break in the peloton and he couldn’t sprint for the win." Wilco Kelderman finished in the wheel of team-mate Paul Martens in 22nd. "Wilco was super supported today and he did not work too much. With the loss of Robert Gesink, we will lead with Wilco Kelderman." On the third day of the Tour of Switzerland tomorrow, the riders face a similar stage as today's. "It will be about the same as today, but with no closing circuits. Again, the final will be hectic and I expect a sprint again. In the morning we decide what to do as a team."